Experienced credit managers frequently deal with joint check agreements, and you already probably understand that you need to treat such agreements on a case-by-case basis. But it takes time to gain the experience needed to determine whether a particular agreement will be good or bad for your business. For many teams, it’s helpful to have experienced and newer credit managers take training or update courses together; as newer team members learn the basics, experienced credit managers can provide wisdom about how those basics are applied in the business. After all, joint check agreements aren’t always what they seem. According to the legal definition from US Legal, a joint check agreement is simply an agreement to allow payment by a check written to two or more parties. In the construction world, for example, if such an agreement is in place among an owner, a main contractor, and a subcontractor, the agreement can benefit the subcontractor because it can help prevent reliance on the main contractor as a sort of “middleman” for payments. Most joint check agreements are written so that, even if the contractor fails to share payment, the subcontractor still has the right to claim his or her payment from the owner. However, the joint check agreement is mainly intended to give the peace of mind to the property owner that all parties involved get their fair shares of the payments they issue. According to a Questia article, it is not a guarantee that those payments will be prompt — or that they will happen at all. 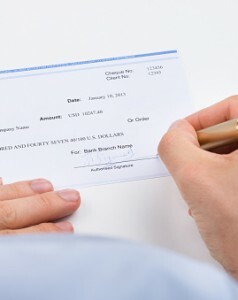 In addition, depending on the wording of the joint check agreement, the payer may not be required to pay by joint check — just allowed to pay that way. Such a distinction can actually create more problems than it solves for lower-tier contractors. A joint check agreement doesn’t allow you to stop managing risk with diligent credit checks, managing aging accounts, or employing sound collection practices. So how can you ensure everyone on your team is up to speed and knows what to look for in a joint check agreement? Train together. Experienced credit managers who bring junior credit managers to training seminars benefit twice: They get a refresher that can help them stay sharp, and they get a way to help others on their team understand complex agreements and know what to look for. This entry was posted on Wednesday, April 6th, 2016 at 12:19 pm	and is filed under Blog Posts, Credit Account Management, Risk Management. You can follow any responses to this entry through the RSS 2.0 feed. Both comments and pings are currently closed.